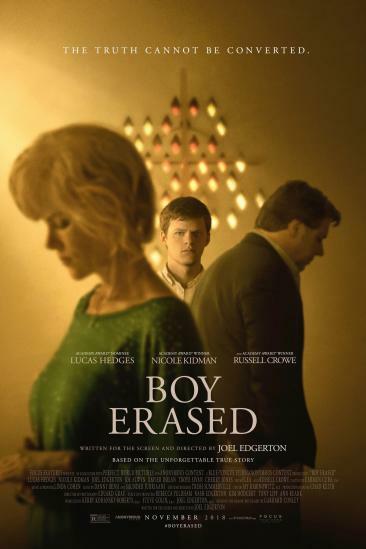 Boy Erased sharply paints an individual's turmoil between sexuality and beliefs. This film made me angry. I was slowly being enveloped by this wave of frustration, an irritant caused by some of the very worst that humanity has to offer. For a film to resonate with me and genuinely make me feel pure hatred for its subject matter as I frequently tensed up during its runtime, well it has to be deemed as a success. Edgerton may not have crafted an award winning drama, but its importance in showcasing the conflict between religious and inner beliefs are unmatched. The son of a Christian family comes out as homosexual. Believing homosexuality to be the mightiest of sins, his father persuades him into attending conversion therapy. A controversial facility that believes it can cure homosexuality, as long as you pay them a decent sum of money, capitalising on the faithful. Utilising emotionally manipulating methods including the release of anger towards your own family members, illustrating genographs to identify sinful members of your family and grabbing Bibles to hit young boys in order to "release the demon inside". Edgerton does not shy away from presenting those techniques, he even stars as the leader of the therapy sessions, and it is with this visceral depiction that allows the drama to make you feel anguish. It's not a melodrama, forcing you to cry. It's not an uplifting drama, where everything turns out great in the end. It's real life. These conversion camps still exist today, and Edgerton poignantly leaves the film with a fact or two to ensure the audience understands the magnitude of these illicit actions. The focus on the emotional conflict between the individuals that are forced to participate was sometimes unbearable. Every single one of them knew they didn't want to change. All of them knew this was wrong. But they played by the rules, because they knew they could do nothing about it. The strictly faithful, which comprises of a sizeable portion of America, view homosexuality as a disease. Regardless if it is their own flesh and blood, these parents would instantly disown their own son. And it was heartbreaking to watch, more so than usual because of how it reflects my personal life. I'm blessed that my parents could deal with my sexuality, but we live in a world where many do not approve. I found that both Kidman and Crowe, although underdeveloped as characters, captured the dominance of Christianity perfectly. Both nuanced performances that made you understand their perspective. Initially a hugely disagreeable viewpoint, they start to alter their faith and find ways to love the son they have always cared for. Hedges gives yet another excellent performance, this time becoming more of a lead actor. It shows he can carry a film, as he showcased a variety of conflicting emotions beautifully. Annoyingly Sivan didn't get much material so cannot really judge him as an actor. A few scenes, such as the college encounter (without spoiling...), were undercooked and quickly forgotten about. However Edgerton's acute focus on this family and the conversion therapy is what truly electrifies. Gorgeous musical score and dramatic slow motion shots to accompany the power of the drama. I'm ashamed to be living as a homosexual knowing that these camps exist. And I'm fortunate that Edgerton has put these diabolically greedy facilities into the limelight. Oh, and these are based on real people, just to enhance the drama that little bit more.